On this day in history in 1931, Leonard Nimoy was born in Boston, Massachusetts (not an easy place to spell without the help of Google. And nope, I didn't cheat. So it's probably incorrect). In the future, a long time ago, in a galaxy far, far away, Leonard Nimoy is busting out of his grave to pound death grip my neck for putting a Star Wars reference into this sentence, instead of a Star Trek one. Leonard Nimoy was best known for singing the most awful song of all time, The Ballad of Bilbo Baggins. It's a song that once you hear, you can never un-hear. Or get out of your head. 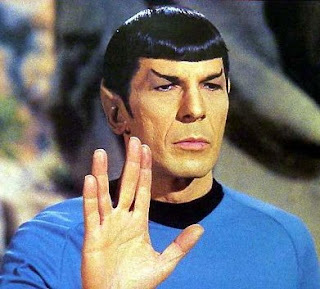 Leonard Nimoy also portrayed the pointy-eared first officer of the Starship Enterprise, Mr. Spock, in a show that became mildly popular quite sometime after it originally aired in 1966. On this day in history in 1934, the driving test for those wishing to drive motor vehicles in the United Kingdom was first introduced. However, it was initially made as a voluntary driving test. So you only had to do it if you could be bothered. It wasn't mandatory until the following year. And then for only those who hadn't been driving before this date in 1934. On this day in history in 1031, Malcolm III of Scotland was born.